 What is a Scholarly Article? There are several components to working with academic sources. First, you must select appropriate resources for your topic. Then you must evaluate the resources you find to ensure that they are authoritative, unbiased, and highly relevant to your research needs. You should also collect and manage your resources in a way that makes it easy to locate and utilize them when you begin drafting your paper. Next, be sure to read your sources critically in order to effectively incorporate the content into your own research and writing. Finally, you will need to make sure you have enough information from your sources to accurately cite them, both within your paper (in-text citations), as well as at the end of your paper (Works Cited list). 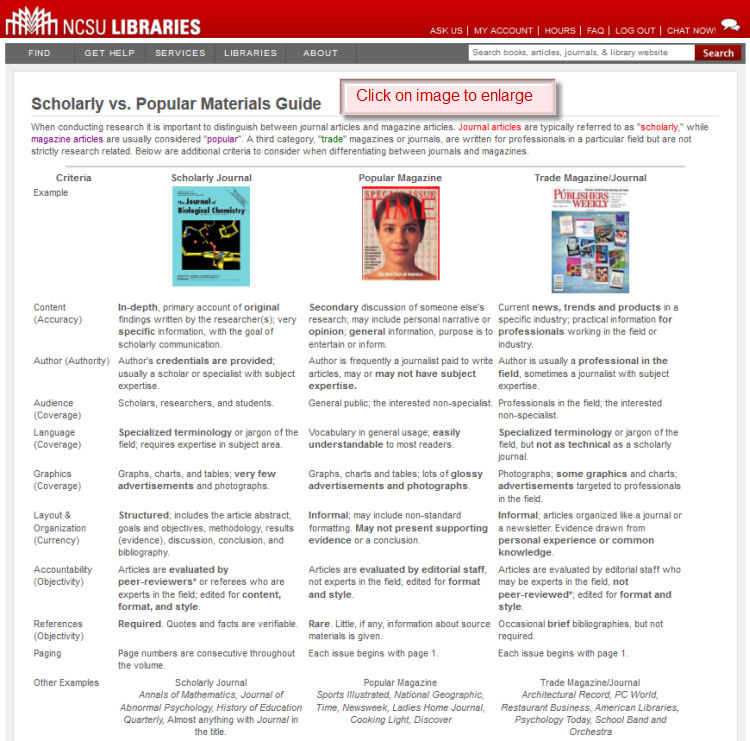 Scholarly vs. Popular Materials Guide helps you determine if an article is from a popular, scholarly, or trade periodical. Academic and scholarly resources are quite different and sometimes difficult to read. The sources below can prove helpful in developing your approach to academic reading. Do you need primary or secondary resources? Do you know the difference? Keeping track of your resources in an orderly manner can help to minimize confusion and frustration when you're trying to incorporate research materials into your paper and reduce your chances of plagiarism. One tool to help you do this is RefWorks. When you are searching library databases, you may select resources for your research and create citations while using the database, export them to your RefWorks account, or use a variety of resources to assist you as you build your bibliography (Works Cited). This free management tool allows you to organize your information including files for your PDFs and research notes. Available for phones, tablets, and computers, syncs between multiple devices.